Captain E. P. Rhoads, Co. B, 47th Pennsylvania Volunteers (public domain). Born in Allentown, Lehigh County, Pennsylvania on 11 November 1833, Emmanuel P. Rhoads was a son of Stephen and Helen (Newhard) Rhoads and grandson of Peter Rhoads, Jr., former president of the Northampton Bank. Two days before Christmas in 1856, E. P. Rhoads wed Amanda Ahlum in Allentown, Lehigh County, Pennsylvania. On 25 April 1858, E. P. and Amanda welcomed son Allen G. Rhoads (1858-1928) to their Allentown home. They also welcomed to the world three daughters: Elmira, Cora and Nellie. Nellie preceded her father in death; her son, Alvin Karr, was raised by E. P. The other three Rhoads offspring married, and began their own families in Ohio. Elmira wed L. C. Brittain, and resided in Toledo; Allen, who lived in Bellevue, passed away in Toledo. Cora wed Edwin Finn, and made her home in Defiance. Emmanuel P. Rhoads is perhaps best known to Keystone Staters as the commanding officer of Company B, 47th Regiment, Pennsylvania Volunteer Infantry. The initial recruitment for men to fill Company B launched in Allentown, Lehigh County. After the fall of Fort Sumter in April 1861, many of B Company’s earliest recruits entered the fray as members of Allentown’s famed Allen Rifles. Formed in 1849, the men of the Allen Rifles “wore regulation blue uniforms, carried Minie rifles, and under the instruction of Captain Good, who was noted as one of the ablest tacticians in the State of Pennsylvania, attained a degree of proficiency in Hardee’s tactics and the Zouave drill which won for them a reputation extending beyond the borders of the state,” according to Alfred Mathews and Austin N. Hungerford, authors of History of the Counties of Lehigh and Carbon, in the Commonwealth of Pennsylvania. Responding to President Abraham Lincoln’s call for 75,000 volunteers in April 1861, the Allen Rifles joined with the Jordan Artillerists, and marched off to defend the nation’s capital as Company I of the 1st Regiment, Pennsylvania Infantry. E. P. Rhoads was one of those early responders. Having already served previously as a 1st Lieutenant with the Allen Rifles in Allentown, he was awarded the same rank when he mustered into Company I of the 1st Pennsylvania Infantry at the age of 27. 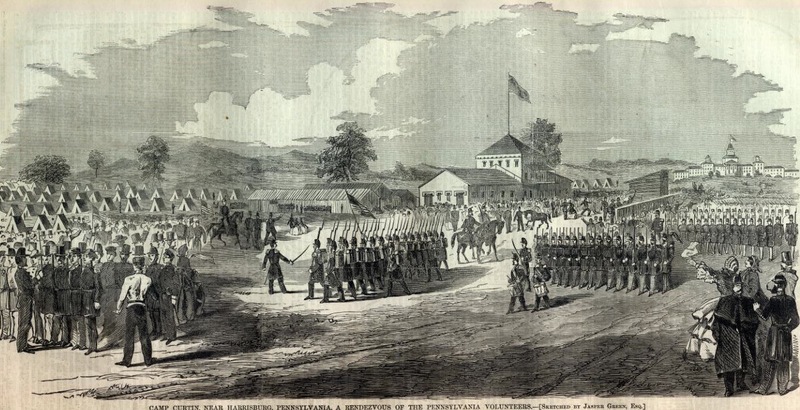 After completing their Three Months’ Service with the 1st Pennsylvania Infantry and honorably mustering out at Camp Curtin in July 1861, E. P. Rhoads and many others from the Allen Rifles reenlisted, becoming the core of Company B in the newly formed 47th Regiment, Pennsylvania Volunteer Infantry. 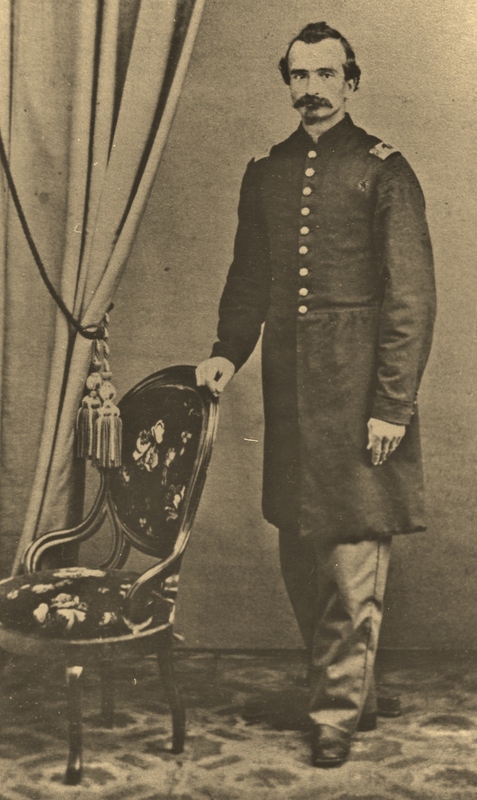 According to A Civil War History of the 47th Regiment of Pennsylvania Volunteers, authored by Lewis Schmidt, E. P. Rhoads was promoted to the rank of Captain on 30 August 1861. Military records at the time described him as an imposing figure. Six feet tall with dark brown hair and black eyes, he had worked as a blacksmith in Lehigh County before enlisting. The members of Company B re-enrolled (or enrolled for the first time) in Lehigh County at Allentown, and then mustered in for duty with the 47th Pennsylvania under E. P. Rhoads’ leadership on the final two days of August 1861 at Camp Curtin in Harrisburg, Dauphin County. Just days later, on 24 September, the men of Company B finally became part of the federal military service, mustering in with much pomp and gravity to the U.S. Army with their fellow members of the 47th Regiment, Pennsylvania Volunteer Infantry. 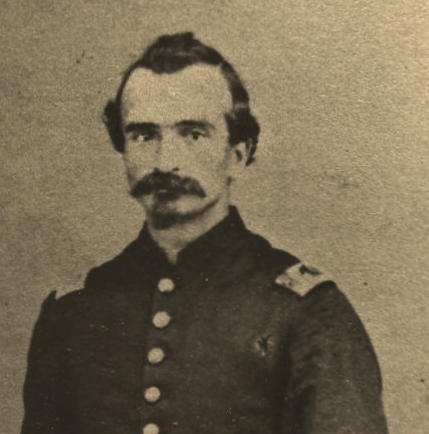 On a rainy 27 September, the men spent a drill-free morning writing letters home and reading, as regimental leaders were learning the 47th was being assigned to Brigadier-General Isaac Stevens’ 3rd Brigade. By afternoon, they were on the move again, under marching orders from General Kasey to head for Camp Lyon, Maryland on the eastern side of the Potomac River. Arriving late in the afternoon, they joined the 46th Pennsylvania in a double-quick march across a chain bridge, and then marched into Confederate territory toward Fall’s Church, Virginia. By dusk, after covering a total of roughly eight miles that day, they were ordered to erect their tents in a deep ravine at Camp Advance. 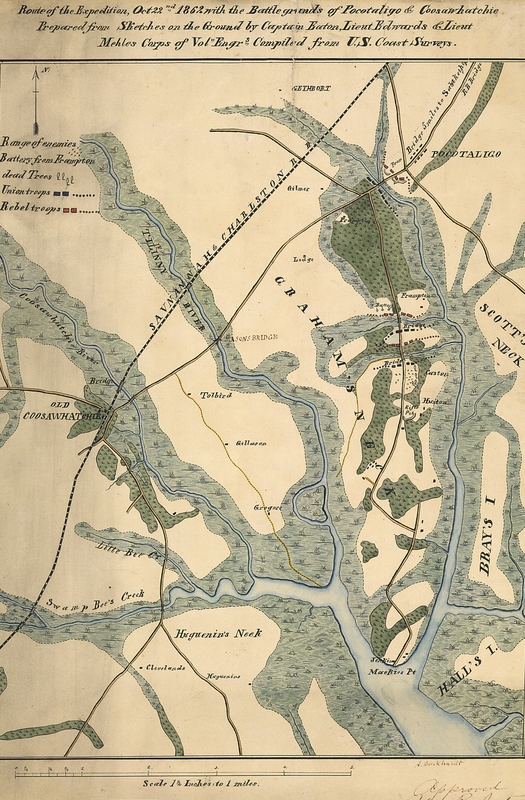 Located about two miles from the Chain Bridge (strategically important enough to be labeled on federal maps as the “Chain Bridge”), they were also stationed near the Union’s new Fort Ethan Allen (still being completed) and near the headquarters of W.F. Smith, commander of the Union’s Army of the Potomac. There, they joined their regiment, 3rd Brigade and larger Army of the Potomac in helping to defend the nation’s capital with the Mississippi rifles supplied by their beloved Keystone State. In October, they were ordered to proceed with the 3rd Brigade to Camp Griffin. On the 11th, Captain E. P. Rhoads and his Company joined the 47th in marching in the Grand Review at Bailey’s Cross Roads. Performing with great skill and enthusiasm, the soldiers of the 47th Pennsylvania were rewarded afterward with new Springfield rifles, courtesy of Brigadier-General John Milton Brannan. Their next truly important assignment saw them quartered briefly in barracks at Annapolis, Maryland before receiving orders from the 3rd Brigade’s commander, Brigadier-General Brannan, to head for Key West, Florida. 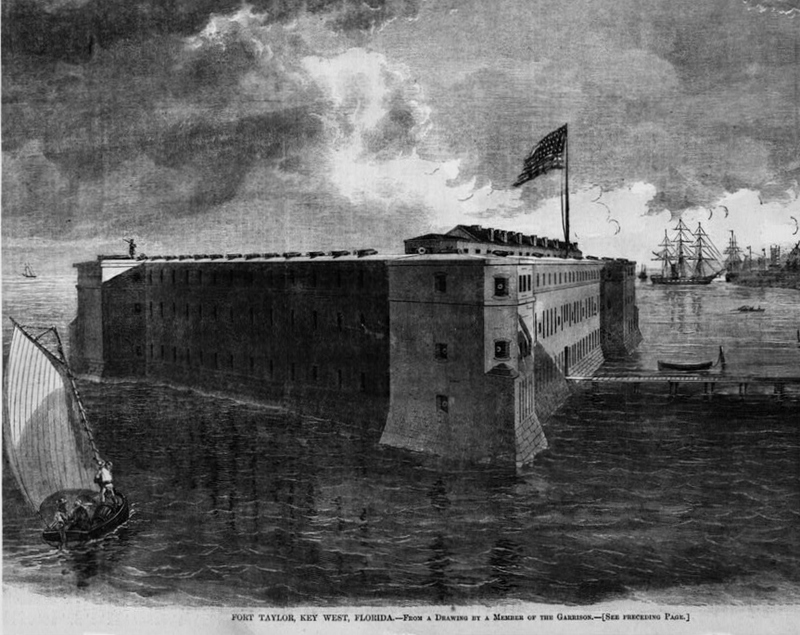 Rendering of Fort Taylor, Key West, Florida, (Harper’s Weekly, 1864, public domain). Departing for Florida on 27 January 1862 via the steamer Oriental, they arrived in February and were assigned to garrison Fort Taylor, one of several federal installations deemed strategically important by Union leaders. Although Florida had seceded from the Union in 1861, the state remained home to a fair number of Union supporters, including slaves fleeing captivity. 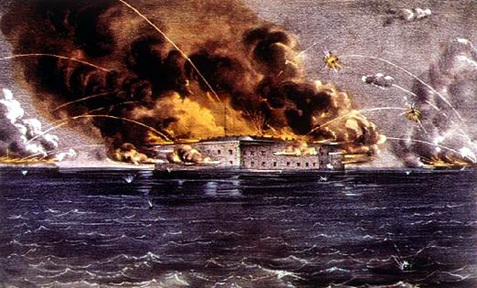 Additionally, Forts Taylor (Key West) and Jefferson (Dry Tortugas) were key to the Union’s defense. While here, the men of the 47th drilled in heavy artillery and other battle strategies – as much as eight hours per day. On 14 February 1862, the regiment made itself known to area residents via a parade through the streets of Key West. That weekend, a number of the men mingled with residents while attending local church services. Their time here was made more difficult due to the harsh climate and prevalence of disease. Many of the 47th’s men lost their lives to typhoid or yellow fever, or to dysentery and other ailments spread by poor sanitary conditions. On 30 September the 47th was sent on a return expedition to Florida where Captain E. P. Rhoads and B Company participated with their regiment and other Union forces from 1 to 3 October in capturing Saint John’s Bluff. Led by Brigadier-General Brannan, the 1,500-plus Union force disembarked from gunboat-escorted troop carriers at Mayport Mills and Mount Pleasant Creek. 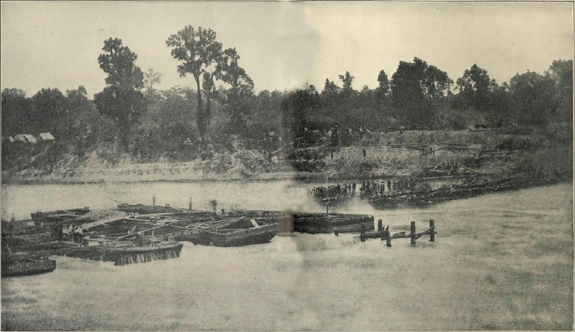 With the 47th Pennsylvania in the lead and braving alligators, skirmishing Confederates and killer snakes, the brigade negotiated 25 miles of thickly forested swamps in order to take the bluff and pave the way for the Union’s occupation of Jacksonville, Florida. From 21-23 October, the 47th engaged Confederate forces in the Battle of Pocotaligo, South Carolina. Landing under the brigade and regimental commands of Colonel Tilghman H. Good and Lieutenant Colonel George W. Alexander at Mackey’s Point, the men of the 47th were placed on point once again. This time, however, their luck would run out. Bedeviled by snipers, they also faced resistance from an entrenched Confederate battery, which opened fire on the Union troops as they headed through an open cotton field. Those trying to reach the Frampton Plantation’s higher ground of were pounded by Confederate artillery and infantry hidden in the surrounding forests. Charging into the fire, Union forces fought the Confederates where they found them, pushing them into a four-mile retreat to the Pocotaligo Bridge. 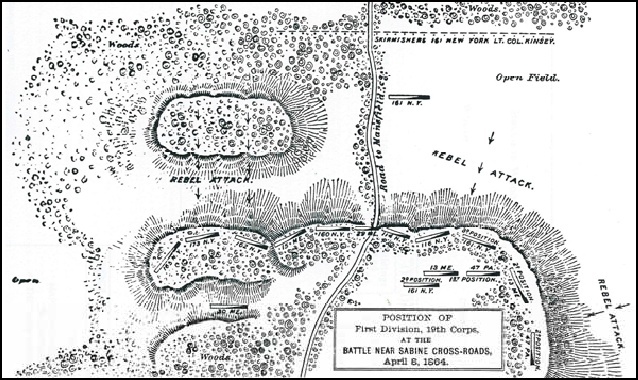 At this juncture, the 47th then relieved the 7th Connecticut, but after two hours of exchanging fire while attempting, unsuccessfully, to take the ravine and bridge, the men of the 47th were forced by their dwindling ammunition to withdraw to Mackey’s Point. Losses for the 47th Pennsylvania at Pocotaligo were significant. Two officers and 18 enlisted men died; another two officers and 114 enlisted were wounded. Several resting places for members of the 47th remain unidentified, their locations lost to sloppy Army or hospital records management, or because one comrade was forced to hastily bury or leave behind the body of another while dodging fire or retreating. On 23 October, the 47th Pennsylvania headed back to Hilton Head, where it was awarded the high honor of firing the salute over the grave of General Ormsby McKnight Mitchel, commander of the U.S. Army’s 10th Corps and Department of the South. Mitchel, who died of yellow fever on 30 October, had gained fame in 1846 as the astronomer who discovered the region on Mars known as The Mountains of Mitchel. The town of Mitchelville, the first Freedmen’s self-governed community created after the Civil War, was also named for him. Captain E. P. Rhoads, Co. B, 47th Pennsylvania Volunteers (c. 1863, public domain). By 1863, Captain E. P. Rhoads and the men of B Company were once again based with the 47th Pennsylvania in Florida. Having been ordered back to Key West on 15 November, they spent the whole of 1863 at Fort Taylor with their comrades from Companies A, C, E, G, and I while those from Companies D, F, H, and K were sent to garrison Fort Jefferson in the remote Dry Tortugas area of the state. Much of their time was spent strengthening the fortifications of both installations. It became a noteworthy year, however, due to the casualties wrought among members of the regiment by disease – and also for the clear commitment of the men of the 47th to preserving the Union. Many chose to reenlist when their terms of service expired, opting to finish the fight rather than returning home to families and friends. On 25 February, the men of the 47th Pennsylvania began a phase of service during which their regiment would make history. Boarding another steamer, the Charles Thomas, Company B and their fellow 47th soldiers traveled from New Orleans to Algiers, Louisiana. Arriving on 28 February, they then traveled by train to Brashear City before moving to Franklin by steamer through the Bayou Teche. There, the 47th joined the 2nd Brigade, 1st Division of the Department of the Gulf’s 19th Army Corps, and became the only Pennsylvania regiment to serve in the Red River Campaign of Union General Nathaniel P. Banks. Rushed into battle ahead of other regiments in the 2nd Division, 60 members of the 47th were cut down on 8 April during the volley of fire unleashed during the Battle of Sabine Cross Roads (Mansfield). The fighting waned only when darkness fell; the exhausted, uninjured men collapsed beside the gravely wounded. After midnight, the surviving Union troops withdrew to Pleasant Hill. Casualties were once again severe. Lieutenant Colonel Alexander was nearly killed, and the regiment’s two color bearers, both from Company C, were also wounded while preventing the regimental flag from falling into enemy hands. Still others from the 47th were captured, marched roughly 125 miles to Camp Ford near Tyler, Texas, and held there as prisoners of war (POWs) until they died there or were released during prisoner exchanges on 22 July and in November 1864. Christened “Bailey’s Dam” for the Union officer who ordered its construction, Lt. Col. Joseph Bailey, this timber dam built by the Union Army on the Red River in Alexandria, Louisiana in May 1864 was designed to facilitate passage of Union gunboats to and from the Mississippi River. Photo: Public domain. Beginning 16 May, D Company moved with most of the 47th from Simmsport across the Atchafalaya to Morganza, and then to New Orleans on 20 June. On the 4th of July, Captain Rhoads and his men received word that they and their fellow 47th Pennsylvanians were to return to the East Coast for further duty. Undaunted by their travails in Bayou country, the 47th Pennsylvania Volunteers continued their fight to preserve the Union during the summer of 1864. After receiving orders to return to the East Coast, they did so in two stages. Due to the delay, the boys from B Company missed out on a memorable encounter with President Abraham Lincoln, and also missed the fighting at Snicker’s Gap, Virginia. Attached to the Middle Military Division, Army of the Shenandoah beginning in August, the 47th Pennsylvania saw the departure, during early and mid-September, of a number of its members who had served honorably, including Company D’s Captain Henry Woodruff, 1st Lieutenant Samuel Auchmuty, and Captain E. P. Rhoads, the commander of Company B. All mustered out at Berryville, Virginia on 18 September 1864 upon expiration of their respective three-year terms of service. 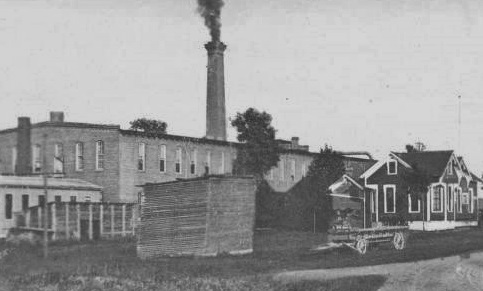 Turnbull Wagon Works, Defiance, Ohio, c. 1910 (public domain). Following his honorable discharge from the military, E. P. Rhoads returned home to his wife and children in Pennsylvania. Sometime around 1865, he moved his wife and children to West Lodi in Seneca County, Ohio. There, he supported his family as a merchant while serving his community as postmaster. After roughly a decade, he and his family moved to the community of Defiance in Defiance County, Ohio. The site of Forts Defiance and Winchester, key locations in the U.S. Government’s westward expansion plans for America in the late 18th and early 19th centuries, Defiance officially became a town in 1822, the county seat in 1845 and, in 1881, a full-fledged city. He never forgot his roots, however, making periodic trips back to Pennsylvania to visit family and old friends. An active member of the Grand Army of the Republic, his aging, but still dignified visage was captured by his G.A.R. comrades from the Bishop Post No. 22 in a 1908 photograph that has been preserved by the Defiance County Public Library. Following a long, full life dedicated to country and community, Emmanuel P. Rhoads died at his residence at 200 Main Street in Defiance, Ohio on Wednesday, 19 August 1914 at 10:45 a.m. He was interred as E. P. Rhoads at the Riverside Cemetery in Defiance on 21 August 1914. End Came at His Ohio Home; Was Native of Lehigh County. Captain Emmanuel P. Rhoads, who commanded Company B, Forty-seventh Regiment, in the Civil War, died at his residence, 200 Main street, Defiance, Ohio, on Wednesday morning at 10:45 and was buried yesterday. Captain Rhoads was born in a stone house at Seventh and Linden streets, where J. S. Lentz’s grocery store is now located on November 11, 1833. He was the son of Stephen Rhoads and his wife Helen H. Newhard, and the grandson of Peter Rhoads, Jr., President of the old Northampton Bank from 1814 to 1836. In 1857 he engaged in the manufacture of agricultural implements with his uncle, Thomas Newhard, at Linden and Church streets, and later at Linden, above Seventh street. He became active in military affairs and was First Lieutenant in the Allen Rifles. At the outbreak of the Civil War when the Allen Rifles and Jordan Artillerists combined and formed Company I of the First Pennsylvania Regiment, he was elected First Lieutenant. The company left for Harrisburg, on Thursday April 18, 1861, and was mustered into the U.S. service on April 20th, serving until July 26th. Upon the organization of the Forty-seventh Regiment, he was elected Captain, of Company B, on August 30, 1861, and served until mustered out on Sept. 18, 1864 at Berryville, Va. He participated in the battles of Pocotaligo, S.C.; St. John’s Bluff, Fla.; Munsura [sic] Plains, Yellow Bayou, Berryville and Bunker’s Hill, in engagements in the Shenandoah Valley, in the Red River expedition and was stationed at Key West. Caption Rhoads removed to Ohio, after the war and was storekeeper and postmaster at West Lodi, Seneca county, for ten years, after which he removed to Defiance, Ohio, where he was connected with the Turnbull Wagon Works for thirty years. He was a member of Wm. Bishop Post, No. 22, G.A.R., of Ohio, and Past Major of Phelps Commandery, No. 4, Union Veteran Legion. He married, at Allentown, Dec. 23, 1856, Amanda C. Ahlum, who died Feb. 20, 1913. Three children survive: Allen G. Rhoads of Bellevue, Ohio; Elmira K., wife of L.C. Brittain, of Toledo, Ohio and Cora L., wife of Edwin Finn, of Defiance, one daughter, Nellie M., is deceased, whose son, Alvin, P. Karr, made his home with his grandfather. Captain Rhoads was a noted drillmaster and was greatly admired by his men. Twelve grandchildren, survive, with one brother, Edwin A. Rhoads, of North Whitehall, and two sisters, Mrs. Sarah C. Lightcap and Mrs. Alice S. Roberts, of Allentown, as well as several nephews and nieces, among whom is Charles R. Roberts, who received the telegram announcing his uncle’s death, and who last visited him in 1904. Captain Rhoads’ last visit to Allentown was in 1899. 1.Bates, Samuel. History of Pennsylvania Volunteers, 1861-5. Harrisburg: 1869. 2. Blacksmith notices regarding E. P. Rhoads, in The Tiffin Tribune. Tiffin: 11 December 1873 and 4 May 1876. 3. Capt. E. P. Rhoads Died Wednesday: End Came at His Ohio Home; Was Native of Lehigh County, in The Allentown Democrat. Allentown: 22 August 1914. 4. Civil War Veterans’ Card File, Pennsylvania State Archives. Harrisburg.